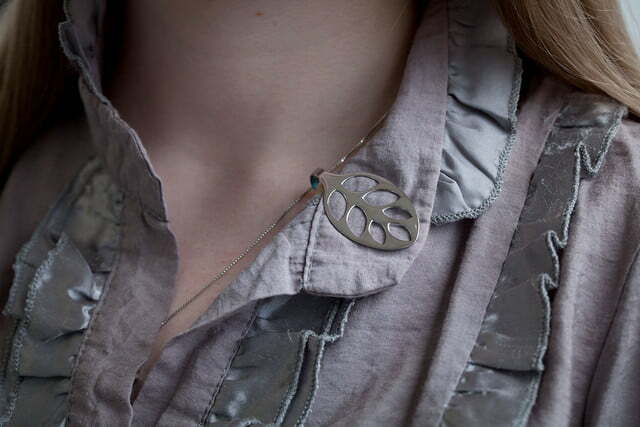 Bellabeat’s Leaf is the best piece of smart jewelry you can buy. Updated 5/12/2017 by Rick Stella: Added an Our Take section concerning the Leaf’s durability, how long it figures to last, its relative alternatives, and whether the Leaf is a worthwhile purchase. 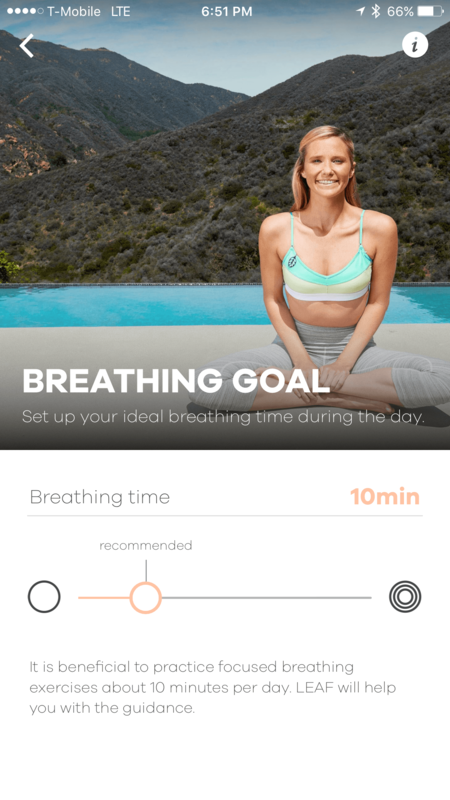 In the year since initially reviewing Bellabeat’s flagship, the Leaf has only improved, showing exceptional longevity with the actual device and its companion smartphone application — which itself has greatly improved, as Bellabeat added a number of new meditation exercises. 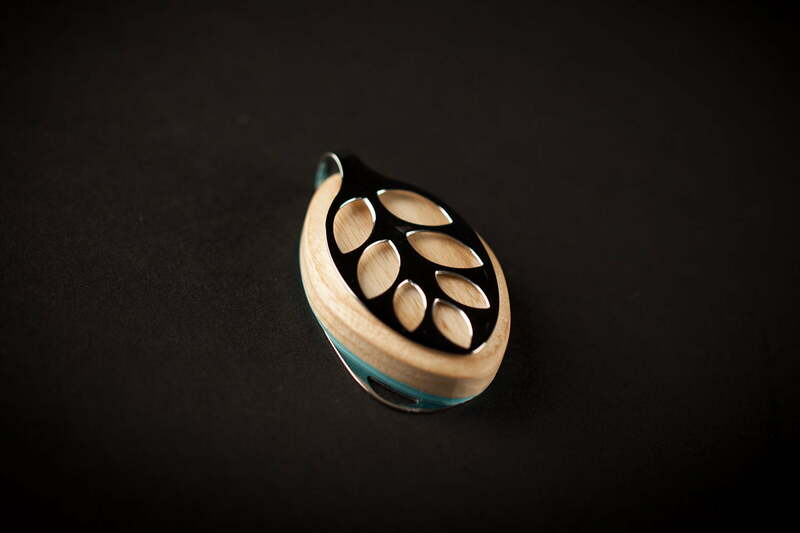 There is one piece of technology that I’ve used for all of 2015 since the day it came out, and it’s not a smartphone, smartwatch, or Fitbit; It’s a piece of smart jewelry called the Bellabeat Leaf. A lot of gadgets cross my desk, and I very rarely feel the kind of connection and excitement with a device that I felt with the Leaf. From the moment I saw it, I wanted to wear it. I’ve worn the Leaf since May 2015 and I’ve watched the companion app grow and improve to meet the demands of Bellabeat’s very tech-savvy user base. 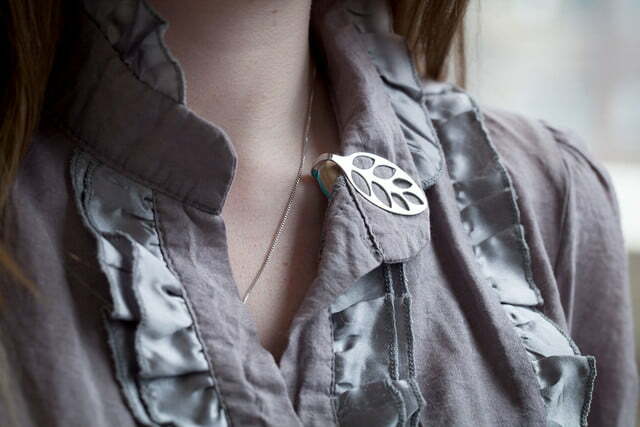 After half a year wearing it, I can confidently say that the Leaf is the best piece of smart jewelry I’ve ever used — in spite of its initial growing pains. As someone who’s tested “unisex” smartwatch after “unisex” smartwatch, it was a joy to find something that had actually been made for me. Bellabeat struck a chord deep within a segment of the population that’s been largely ignored by the wearable tech craze: women. Women who don’t want to wear a generic unisex Fitbit or Polar tracker, let alone a cheesy pink Misfit Flash or a sparkly Swarovski Shine on a daily basis are drawn to the Leaf’s simplicity, class, and elegance. 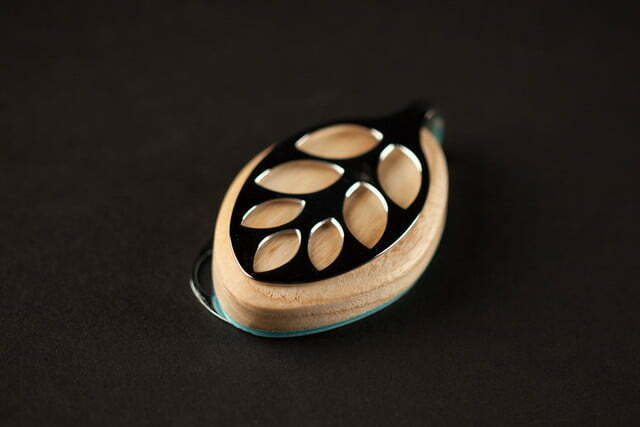 It’s shaped after its namesake and made of natural wood and stainless steel. Depending on which model you choose, you’ll get a light wood with silvery steel or a dark wood with either gold or rose gold colored steel. 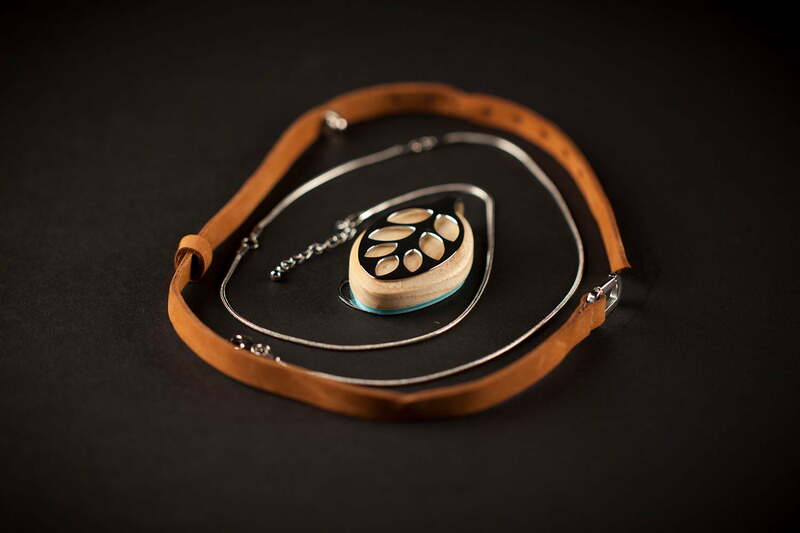 It comes with your choice of a necklace or the proprietary bracelet, which is made of premium leather and comes in light or dark colors to match the wood of your Leaf. My initial review unit came in the light color palette but I’ve used the dark wood version, too. It’s a beautiful, understated device, though it is bigger than you expect it to be, measuring nearly 2 inches long and about half an inch thick. I have very small wrists but the Leaf was still comfortable as a bracelet. I tend to wear it as a clip or necklace the most but it’s a matter of personal preference. 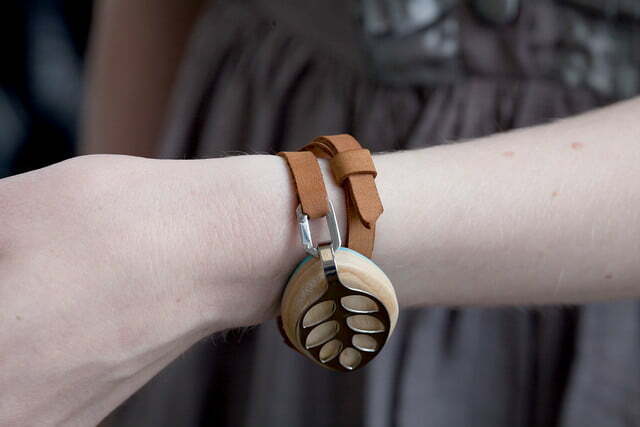 If you need style ideas, Instagram is chock-full of Leaf wearers who can’t get enough of its stylish wooden body, stainless steel case, and attractive leather wrap bracelet. 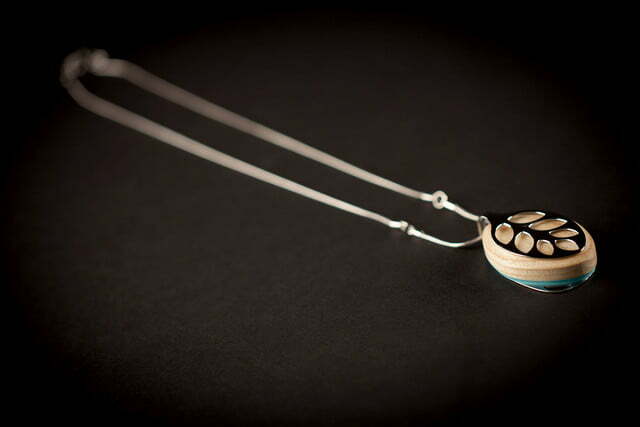 Some wear it styled as a bracelet, others a broach or even a necklace. The key to Bellabeat’s success lies in the versatility of the Leaf’s design. 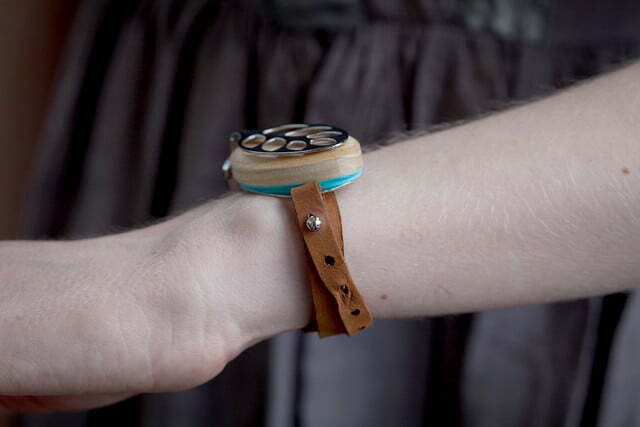 You don’t have to wear it on your wrist and most women don’t. Better still, you don’t have to buy a dozen accessories to wear it differently. Because it’s a clip, you can slide it onto any necklace and most bracelets you already own and to wear it as a clip, you don’t need a single thing. It’s truly genius to create a wearable that fits in with your existing accessories instead of requiring you to buy new ones the way Misfit and Fitbit do. The Leaf looks like normal jewelry, so it’s often mistaken as a necklace, pin, or cool bracelet — not a piece of tech. I’ve gotten many compliments on the Leaf from non-tech savvy friends and the techiest of my coworkers. It blends in with my other jewelry and my sense of style, which isn’t something I can honestly say about any other wearable I’ve donned. That’s why I’ve worn it every day since it arrived. The Leaf tracks movement with its accelerometer and from that data, algorithms estimate exercise, sleep, and breathing data. When you set up the app (Android & iOS), Bellabeat asks you to sign in with Facebook or create an account with your email. Then, you set up your profile with your height, weight, birthdate, and goals. The app suggests activity and sleep goals based on recommendations from the CDC and World Health Sleep Foundation. The base goals are 20 minutes of activity a day and seven to nine hours of sleep each night. You can, of course, be an overachiever and set your goals higher. From then on, the piece tracks your progress on a scale from zero to 100 on the main screen of the app. 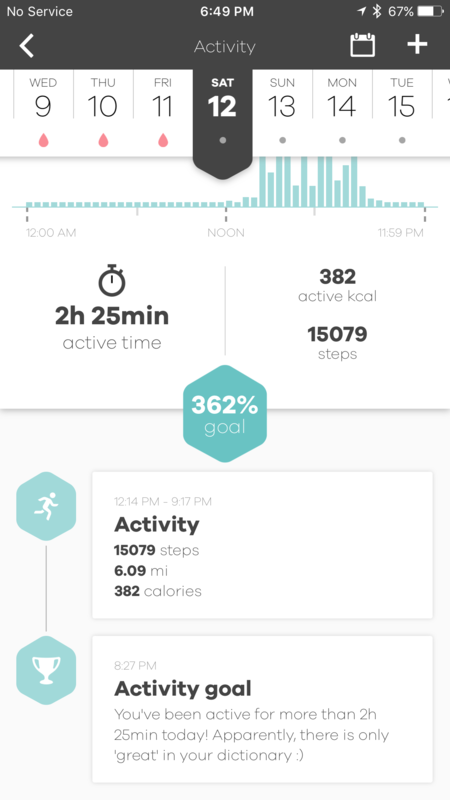 A tap on the activity bar shows you a breakdown of all your activity for the day in graph form with detailed stats and cards for individual activities below. Activity tracking, which is the Leaf’s bread and butter, is solid. The app keeps track of how long you’ve been active, how far you’ve walked, and how many calories you’ve burned. 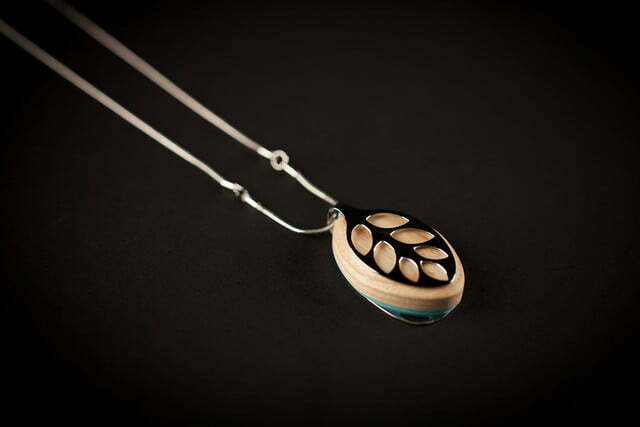 The Leaf looks like normal jewelry, so it’s often mistaken as a necklace — not a piece of tech. Activity tracking is mostly on-point and comparable to the competition but the accuracy does vary slightly depending on where you wear it. When it’s clipped on your shirt or worn as a necklace, the app tends to underestimate your activity. 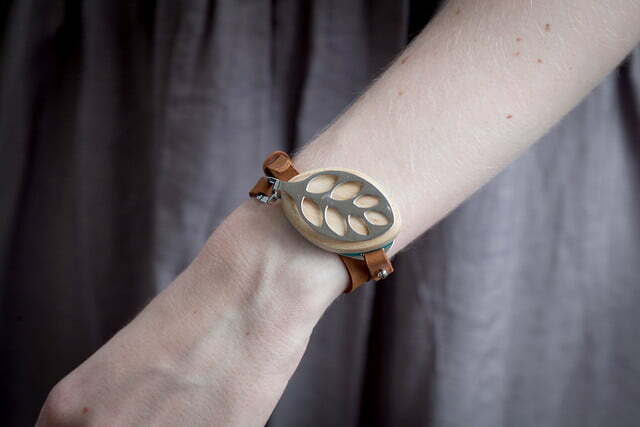 On the wrist, the Leaf provides more liberal readings, kind of like Fitbit. 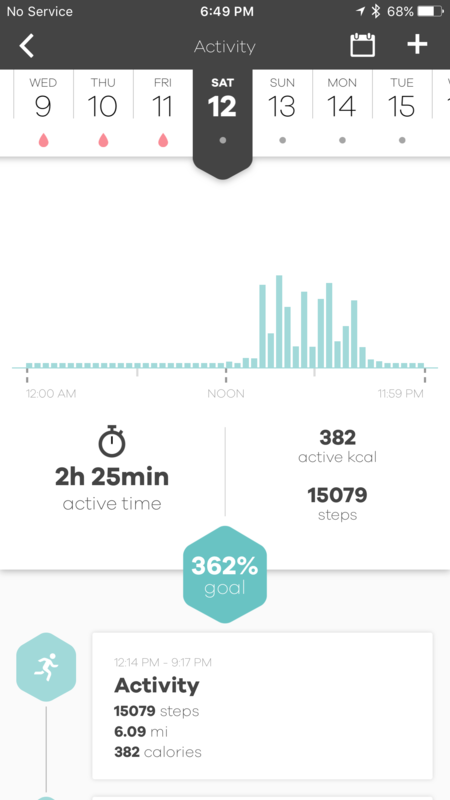 Waving your arm with a Fitbit results in 10 extra steps in your count, making the Leaf more accurate in that regard. 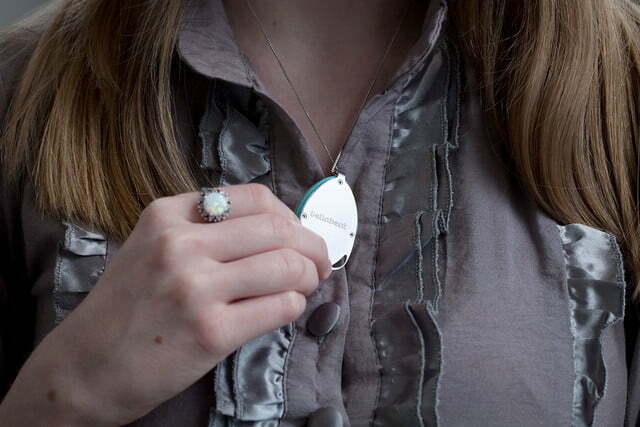 It would be ideal if Bellabeat added an option to say how you’re wearing the Leaf during the day, to ensure that the tracking is even more accurate. The app already offers this option for sleep, so it’s not much of a stretch to add it for activities. A recent app update added the option to manually track different kinds of activity, so if you know you’re going to be running for 30 minutes, you can select that exercise and the Leaf will know to really pay attention to your activity levels. This is more important when you do less traditional exercises like yoga. Previously, when I did yoga, the Leaf didn’t always know I was active because there’s quite a lot of holding poses and stretching involved. The new manual activity entry is a huge improvement and it opens the Leaf up to a whole new world of activities and fitness. The second bar on the main page of the app is for sleep, which is something that’s more difficult to track. The app measures your sleep duration and quality automatically with accuracy but sometimes struggled to get exact sleep and wake times. My wake times were typically off by about 10 minutes, which was understandable, given my fondness for checking email in bed every morning. Recent app updates improved sleep tracking and the app even checks to be sure it got the times right before logging them. Most wearables struggle with getting the times exactly right, though, and the discrepancies aren’t any higher with the Leaf than they are with the Misfit Shine, Withings Activite, or Fitbit Charge – all of which I’ve tried. Some wearables like the Runtastic Moment don’t even offer automatic sleep detection. Bellabeat’s silent alarm is another fantastic feature that really helps you wake up peacefully instead of to a blaring alarm. It’s one of the features that’s become commonplace on wearables these days because it’s an absolute must have. You can also set other alarms to remind you to drink water, eat lunch, or what have you. 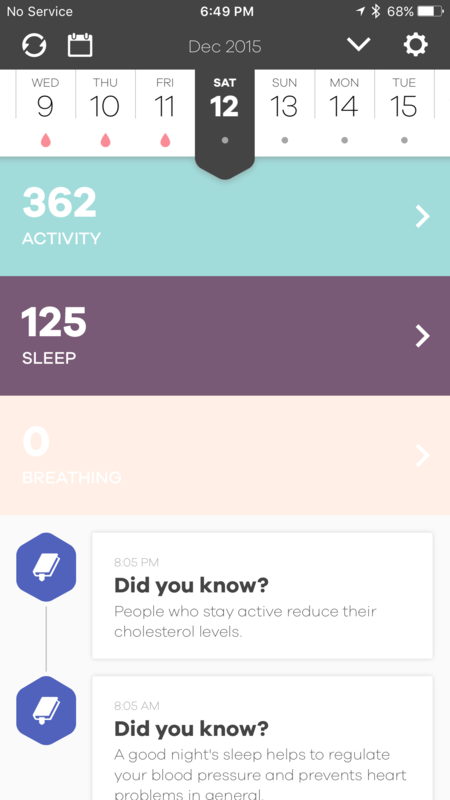 The final bar on the app’s main page is for breathing exercises. This is one of the Leaf’s most unique features — and it’s also one of the best. Breathing exercises are excellent for easing away stress and aiding in concentration. Did I feel like a hippy at a meditation camp the first time I did it? Yes, but the feeling of relaxation and peace is well worth it. I’m pretty Type A and definitely a perfectionist. My shoulders get keyed up to my ears pretty much every day, so forcing myself to take 10 minutes to breathe is very helpful. After you’ve done the breathing exercise once, you’ll wonder why you never did it before. To prep for the exercise, you simply clip the Leaf onto your pants’ waistband so the Leaf can track the rise and fall of your belly as you breathe. A calm, soothing woman’s voice guides you through the breathing exercise and teaches you the art of meditation. If you’ve never done it before or you’re not a yoga person, it takes some time to get used to it. After you’ve done the breathing exercise once, you’ll wonder why you never did it before. The exercise also gets more intense as you get better at it. 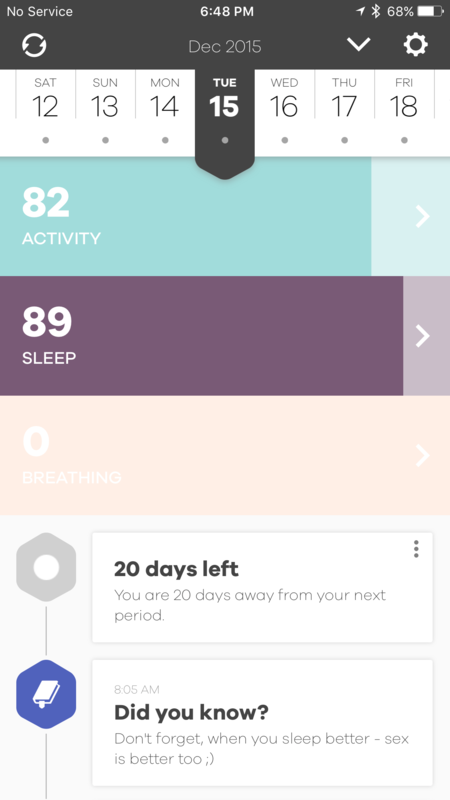 Since Bellabeat’s focus is on women, the app reminds you, matter of factly, that breathing exercises are also great for cramps when you’ve got your period, which is the other unique metric the app keeps track of for you. It’ll even warn you when it’s coming, which is pretty darn helpful. Previously, I used Clue to track my period and I still do because its feature set is stronger, but Bellabeat could easily build upon the feature to make it more robust. 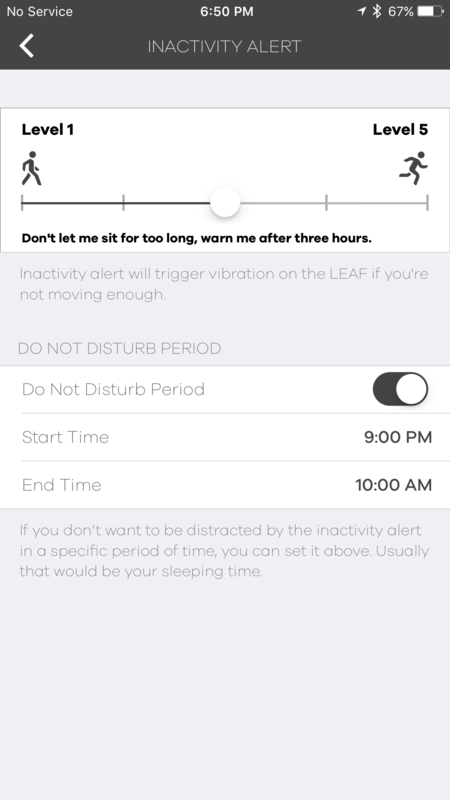 It also tracks fertility, so if you want to get pregnant, your Leaf will help you out with figuring which days you’re most fertile. You can turn that off, though, if you’re not currently planning a family. There’s a lot going on in the app but it’s still easy to use. One of its best features is a simple small thing: positive feedback. Bellabeat wants you to know when you meet your goals and celebrate with you. Motivational cards cheer you on and tell you interesting factoids about how your achievements translate into real-world benefits. For example, when I hit my activity goal on Saturday, Bellabeat told me “there is only the word ‘great’ in your dictionary.” Another day it asked if it could “crown the Queen of Healthy Sleep? :)” after I clocked in a good 10 hours of sleep on a weekend. I’ve also been likened to a cat for my weekend sleep habits. It sounds silly but positive reinforcement helps, even if it’s canned. There’s potential for more here and the app could offer advice or suggestions on how to improve, which is something very few trackers do right now. 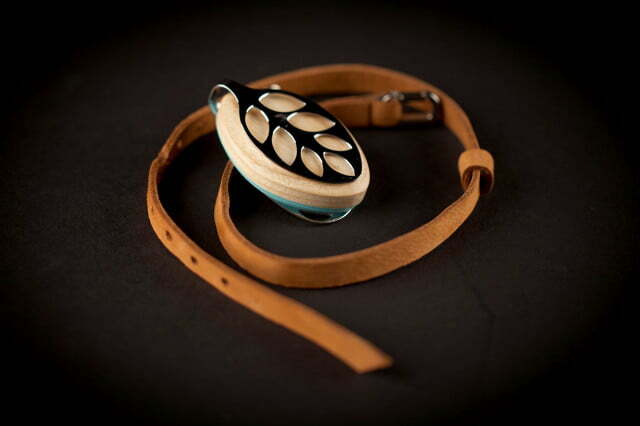 Bellabeat’s Leaf is more advanced in that regard than pretty much any other tracker I’ve tried. Its encouragement is also witty and unique, which makes it stick out more. Bellabeat’s not in the business of helping gym rats get buff — it just wants women to live healthy happy lives and that’s what the app focuses on. 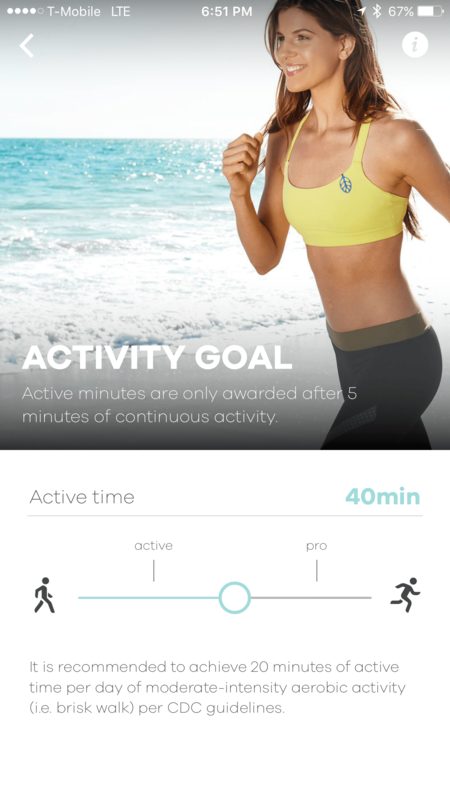 Ironically, the hardest thing about selling a fitness tracker is making a good app. Bellabeat’s app certainly had growing pains in the beginning but it’s developed into a solid app for tracking your well being. The battery should last you six months, and it’s replaceable. The first wave of Leafs went out without the tiny screwdriver you need to change the battery but now every Leaf comes with one. The battery is cheap and easy to buy online, so you don’t have to worry that it’s something obscure. There’s also no charging involved, which is a bonus. However, changing the battery is a bit of a hassle. The screws are really, really small, and so is the screwdriver. Luckily, I didn’t lose any and the package did come with extras, but it was pretty nerve-wracking opening the Leaf up. When you do remove the screws, the metal part slides off the wooden part, and you see a thin spongy protective layer. When you lift that up, you can see all the internals and the battery, which pops out easily. Once you’ve replaced it, you can just screw it back together. The first one is the hardest to align. After nearly 6 months of use, my original Leaf still had a lot of juice — it was around 40 percent. That was also an early review unit, and so far, the final retail version I got seems to have even more longevity. 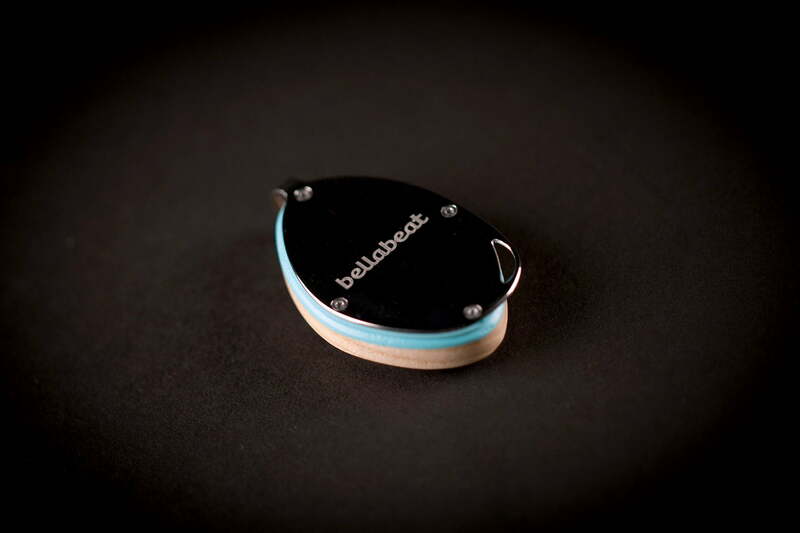 The Bellabeat Leaf has a one-year limited warranty, but it doesn’t cover much more than serious defects. 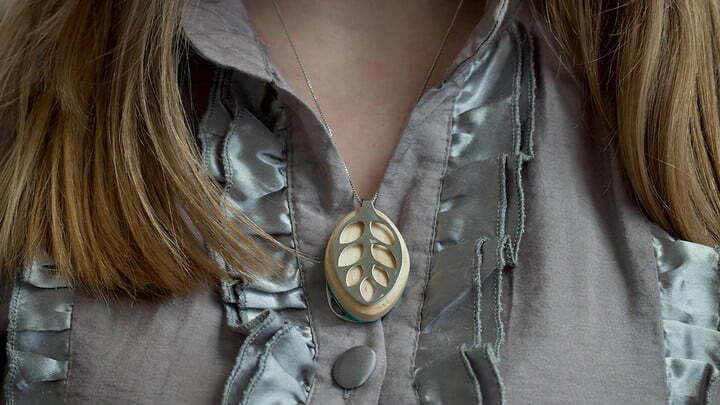 If you treat your Leaf with care like you would a necklace or bracelet, the odds of it getting damaged are pretty low. It’s even survived a few tumbles through the washer, according to forgetful Leaf owners’ posts on Facebook. Bellabeat’s Leaf is the best of both worlds: It’s a smart fitness tracker and a gorgeous piece of jewelry. Most smart jewelry offers less functionality for more money, and some don’t offer activity tracking at all, like Ringly and Altruis, which focus on notifications instead. The Leaf ranges from $120 to $150, depending on the model, while Ringly costs $195+, Altruis costs $345+, and the Fossil Q Dreamer costs $125. The Leaf soars past its main competition in the space because it offers the same level of functionality as a Fitbit or a Misfit Shine, but with much more style. Bellabeat’s Leaf costs the same or less than most straight up fitness trackers from Fitbit, Polar, and other companies. Misfit and a few others offer cheaper trackers but they’re not as elegant or versatile in terms of style as the Leaf is. Bellabeat’s other advantage comes from its admittance that the Leaf is not meant for fitness freaks – it’s just for women who want to lead a healthier life. In terms of direct alternatives, Ringly makes two fitness jewelry accessories (a smart ring and smart bracelet) though neither offer sleep trackers, which — as mentioned above — the Leaf has in spades. After wearing the Leaf daily for the better part of a year, the tracker continues to function incredibly well. Aside from normal wear and tear — which is minimal, as is — nothing about the device looks ready to break down. Furthermore, consistent app updates mean the Leaf is just as relevant, or better, today as it was when Bellabeat released it. This kind of routine maintenance is also something wearers can expect to enjoy for several years as the Leaf remains Bellabeat’s flagship activity tracker. Yes. 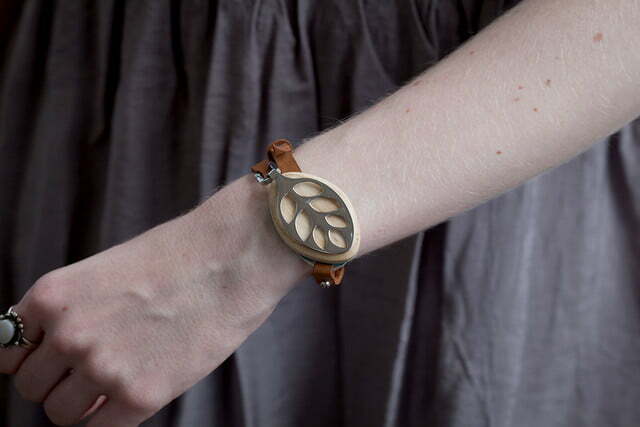 The Leaf isn’t just our favorite piece of smart jewelry, it’s also our favorite fitness tracker. If you’re a woman (or you know one) who’s always complaining about how ugly wearable tech is but really wants to try out a fitness tracker, you’ll love the Leaf.